If you are using Moodle version 3.3 or above then kindly scroll down to continue reading. Note: If you are installing Edwiser RemUI v3.6.2 on your Moodle 3.6.x environment then do update the Edwiser RemUI block plugin to version 1.0.3. Once you download Edwiser RemUI version 3.6.2 or version 3.5.7 or version 3.4.9 you have to extract this zip file. (This contains three files one is for Edwiser RemUI theme files, second is Edwiser RemUI Block plugin and third is Edwiser RemUI Course Format plugin. If you are using Moodle version 3.0 or 3.1 then you should use Edwiser RemUI version 3.0.0 or 3.1.4 respectively. For Moodle version 3.2 please download Edwiser RemUI version 3.2.4. If you are using Moodle version 3.3 please download Edwiser RemUI version 3.3.9. Login to your Moodle site as an admin and go to Administration → Site administration→ Plugins→ Install plugins. Upload the ZIP file. You could be prompted to add extra details (in the ‘Show more‘ section), if your plugin is not automatically detected. If your target directory is not writeable, you should see a warning message. Check the plugin validation report, to verify if the theme has been successfully installed. Follow below given steps to change the theme on your Moodle site. To activate the license, go to Site Administration → Appearance → Themes → Edwiser RemUI → License Settings. Add your 16 digit license key (which you must have received in your purchase receipt) in the input box and hit the ‘Activate License‘ button. Once you activate a valid license, the site-wide license activation message will be disabled. NOTE: Kindly make sure that the ” curl_exec ” PHP file is enabled in your Moodle server so that the license key gets activated without which you shall receive an “Invalid key” message. Kindly make sure that ” Blogs ” are enabled in your site so that profile page is visible. If you enable this setting then all header buttons will be clubbed under one button with a drop-down. This is a default setting where course-related stats will be available for Administrator, Manager, and Teacher user roles in the course page. You can disable this setting as per your requirement. Now you can send out announcements for all your users about important things related to your campus. Choose the ” Announcement Type ” of your choice from 4 different styles for the announcement. ” Enable New Dashboard ” checkbox. You can set the number of courses (4,8 or 12) that you want to display in the course archive page of your site. Icon and Sitename – In this format you could upload icon as well as sitename and they will be correspondingly displayed. You could choose icon from list of font awesome icons. Logo Only – You can upload image of your choice from the given uploader. 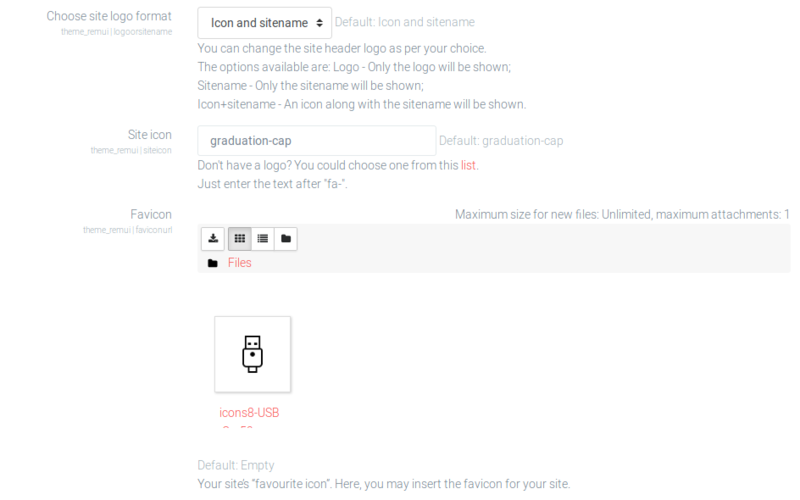 You could upload any image of your choice as Favicon for your Moodle site. With this option you could use default fonts given in the theme for your site. Or go for Google Fonts if you want additional fonts for your Moodle site. You can add custom CSS in this section but do note that the changes will be reflected through out the Moodle site. Add your Google Analytics tracking ID here in order to track its results. Now you could detect the meaning of the word that you are typing in during your course creation on the go. Simply enable Dictionary by enabling this setting and we will take care of rest of the things. Follow this path to reach this setting Site Administration > Appearance > Themes > Edwiser RemUI > General Settings > Enable Dictionary Checkbox. With Static Content you can select whether you want to add a video or an image as the header content. To add a video, you will need to select Video URL as ‘Select Content type‘, and add the URL of the relevant video in the ‘iframe Embedded code’ custom box. If you set ‘Select Content type‘ as Image, then you can upload an image to the ‘Upload Image‘ field. In the ‘Add Text‘ field you can add content which will displayed as an overlay on the image. By selecting ‘Slider Content‘ you can add a slider on the header. You can set the ‘Slide Interval‘ in milliseconds, ‘Set Slider Autoplay‘ to your preference, and the ‘No of slides‘. The main body of the homepage or front-page displays the courses, has a four column layout to display information, and an about us section. In the four column layout, each section has the same options, but you can customize it based on your preference. You can enable or disable a button for the section using this option. A button is displayed after the icon and section description. You can add a title for the section here. In this custom box, you can add the description of the section, which will be displayed under the title. You can use the default icon or add a Font Awesome icon of your choice here. For the button you add to this section, you can set the button label here. Add a link for the button here. By enabling or disabling this checkbox you can enable or disable the ‘About Us‘ section. You can add a custom heading to the ‘About Us‘ section using this field. You can add the description in this custom box which will be displayed below the title. You can add image to this section by uploading an image of your choice. You can either enable only ” About Us ” or ” Testimonial Section ” or both in the front page. If you are using the testimonial section then kindly follow the steps mentioned below. You can set the number of testimonials that you want to show in the frontpage from this dropdown. Upload image of the user in this uploader. You can also add name, designation and the testimonial to be displayed in the landing page. 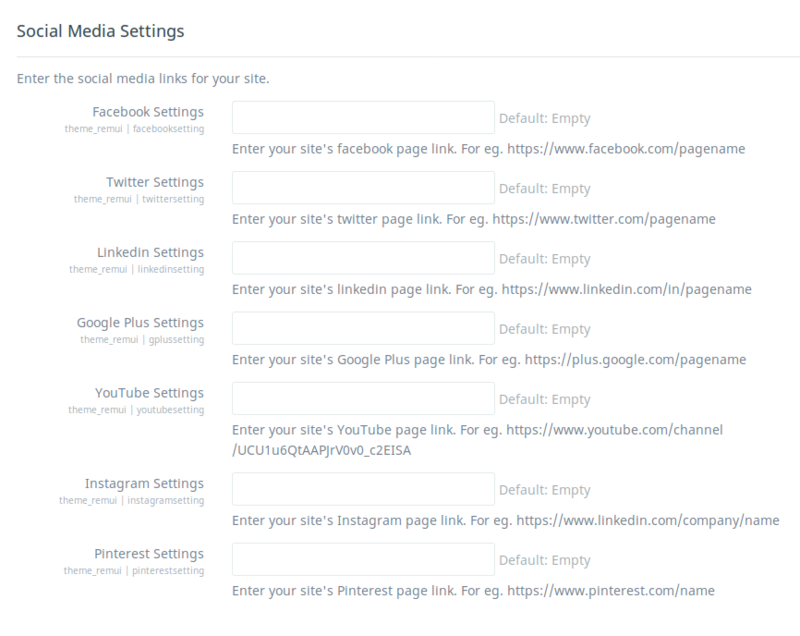 In this section, you just have to add links to your relevant social media account so that your users are redirected to those pages. Social network icons will be displayed in the footer of your Moodle LMS. Here you can add a title to the footer section. In this custom box, you can add text relevant to the column title. In this custom box, you can add the text of the quick link you want to display to your users like “Copyright” etc. Add a link to which you want your users to be redirected when they click on the quick link text. You can disable login pop-up in the site home by clicking on this checkbox. You can upload a background image of your choice using this option. 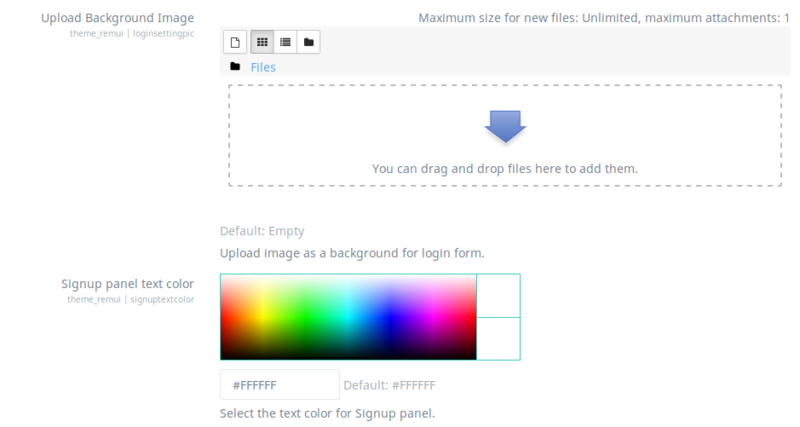 Here you can select the text color of your choice which will be reflected on the Login/Signup panel. Click on the first link just in case you need detailed information about how to set up this service. With Edwiser RemUI 3.3, you no longer have to visit the Settings page to apply color customizations to your Moodle instance. Step 1. Click on the “Left Sidebar” icon, it will open the customisation tab. Step 2. Under this tab, you can select several pre-defined colors. Step 3. You can even choose the “Custom Color” option which pops open the Color Picker to choose your own custom color. You can also add the HEX code here. Step 4. Click the “Apply Sitewide” button to apply this color throughout your site. Log in to your Moodle site as an admin and go to Administration → Site administration→ Plugins→ Install plugins. Upload the ZIP file. You could be prompted to add extra details (in the ‘Show more‘ section), set it under block category. Check the plugin validation report, to verify if the plugin has been successfully installed. 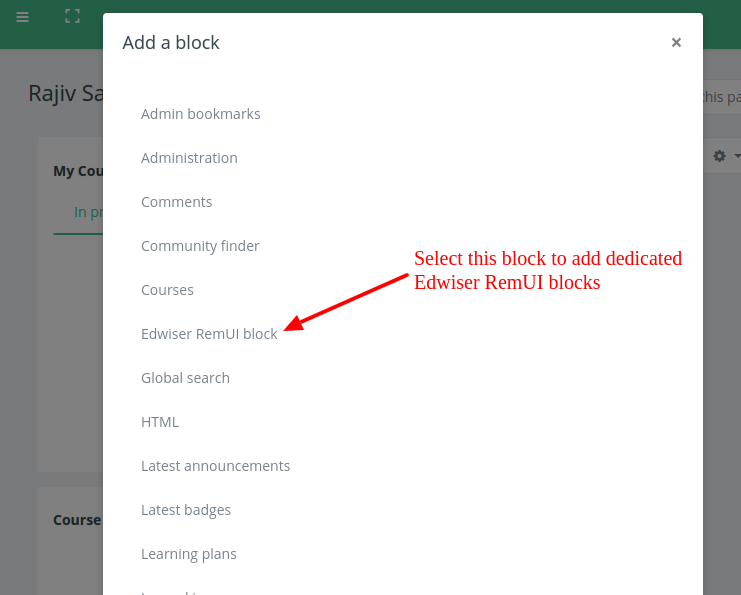 This will make sure that all the dedicated Edwiser RemUI blocks are set in the “Content Section” of Moodle dashboard. Go to RemUI settings -> Dashboard settings Tab. Here you can enable or disable RemUI specific block as per your choice. 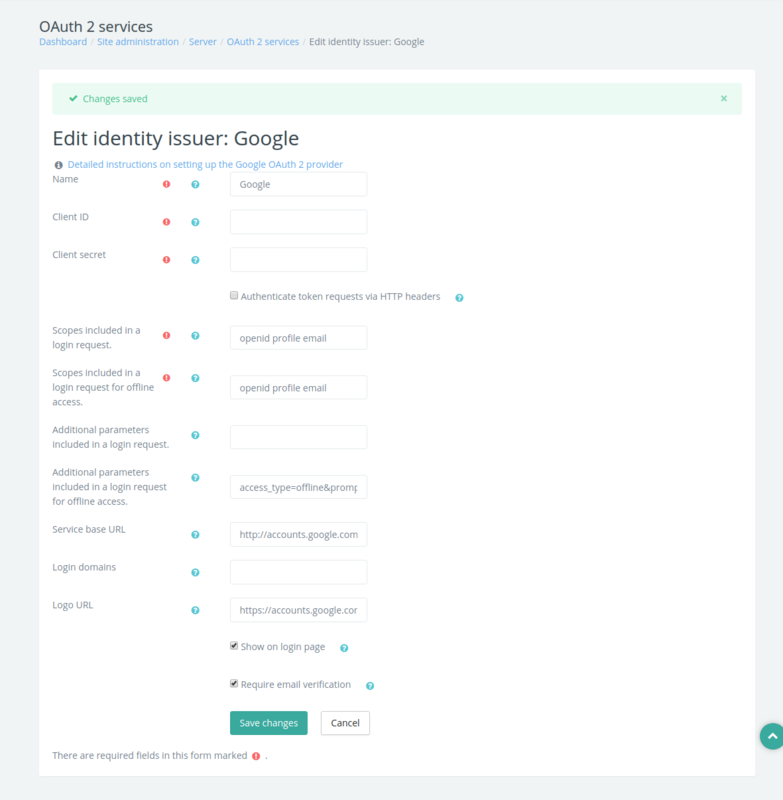 Note: If you want to configure and reset the Dashboard for all user then navigate to Site Administration -> Appearance -> Default dashboard page. Once you have configured then you need to click on Reset dashboard for all users. The Edwiser RemUI – Course Formats plugin will be available as part of the Edwiser RemUI theme files. Simply extract the zip file from “Edwiser_RemUI_3.6.2.zip” and you will get the course format plugin named as “format_remui.zip” available as part of it. Upload the “format_remui” ZIP file. You could be prompted to add extra details (in the ‘Show more‘ section), set it under “Course Format” category. 5. Once you have decided on the format that has to be applied you can upload an course image from the image uploader. The images uploaded to “Course Summary Files” section will be visible as the feature image of the course in archive page. Whereas images uploaded to “Choose a course image” section will result in the image to be visible in the single course page. This image will be visible only for “List Layout” of “Edwiser RemUI Course Format” plugin. In the “Card Layout” of “Edwiser RemUI Course Format” plugin you won’t be able to give labels inside Moodle activities. Just in case you already have labels created in a course then we would suggest you to remove it in order that course gets displayed well. Grid Format – A modular and visual course format. Hides all topics and creates a grid of icons (one for each topic) with short titles. Clicking on an icon brings up the content from the corresponding topic. One Topic Format – OneTopic format provides a tabbed format (similar to the Animated Slide and Tabbed formats we’ve seen previously). The tabs can each have a custom name (so you can increase the navigability of your courses with text cues) and it’s automatically formatted by the number of course topics you have. This format is based on the Moodle standard format: “Topics”. It accepts edition by AJAX. Buttons – Buttons is a course format that creates a menu with buttons to access the sections, one by one. Board (Grids & Blocks) – “Board (Grids and Blocks)” is a course format in grid for 2.8 and Plus versions of Moodle with full flexibility between sections and columns. You can choose the number of columns and adjust the desired width for the same, you can also choose the number of sections in each column. NED – Tabs course format – The Tabs Course Format displays sections as numbered tabs. The number of tabs is unlimited and the colour settings (text, hover, background, etc.) can also be customized. Install these course format plugins on your Moodle site depending on the versions that support your Moodle site. Go to Any course page > Click on Gear icon at top right corner > Click on “Edit Settings” button > Scroll down to “Course Format” Section > Now from Format’s section choose any format of your choice > Once you have selected the format of your choice, Hit the “Save and Display” button this will save all the changes. As a result, the course will be represented in the course format that was selected by you. Now give your students a new learning experience in each course with multiple course formats. You could remove ” Private Files ” & other links from the left side navigation of Moodle using the below-given custom CSS code. Fix – Changed the styling and provided support for Course overview block, Recent Accessed Items, Recent Accessed Courses and Timeline. Fix – Quiz, assignment activities UI improved and also will have sidebar opened by default. Feature – Added custom CSS as part of theme to make user tours similar to how it is displayed on Edwiser RemUI demo site. Fix – Send button for messages cropped. Fix – PostgreSQL issue while installation. developed this feature and shared it with us. Tweak – Search Courses with Short Name also in the course archive. Tweak – Font Awesome icons are supported throughout the theme. Fix – Formatting does not work for Course Description that is written in the Course summary input area. Fix – In RemUI homepage settings the section which says ‘Body title for 1st Section’ is same for two different settings. Fix – Lots of space is being used in the top header menu in mobile view. Fix – Bug in the user profile. When the first name contains 2 words such as Jaures Inos Chapelle, it became JauresInos Chapelle. Space is being ignored by RemUI. Feature – Course Analytics Block which displays the user performance in various courses. Feature – Notification ticker displaying the latest announcement and notifications. Feature – Ability to switch between different dashboard layout. Tweak – Recent forum section now displays the replies count, latest replied and users recently active in the forum. Tweak – Quiz layout is improved with new styled radio buttons and checkboxes. Tweak – Improved the participation page layout. Tweak – Courses on Course Archive Page is now displayed with the latest-oldest format. Tweak – Category description and enrollment icons are now displayed on course archive. Tweak – Revert sidebar open/close icons to the old version of RemUI. Tweak – Display content related to subcategory when parent category is selected. Fix – Quiz layout responsiveness issue in mobile view. Fix – Auto scrolling of Frontpage slider not working in the mobile view. Fix – Database Error with PostgreSQL and other databases. Fix – Course creation link not working when a miscellaneous category is deleted. Fix – IE issues – right sidebar content not displaying properly. Fix – Scorm Package sidebar not displaying properly. Fix – Missing translation strings are included. Feature – My courses page with course status & progress. Feature – Course resume button on my courses page. 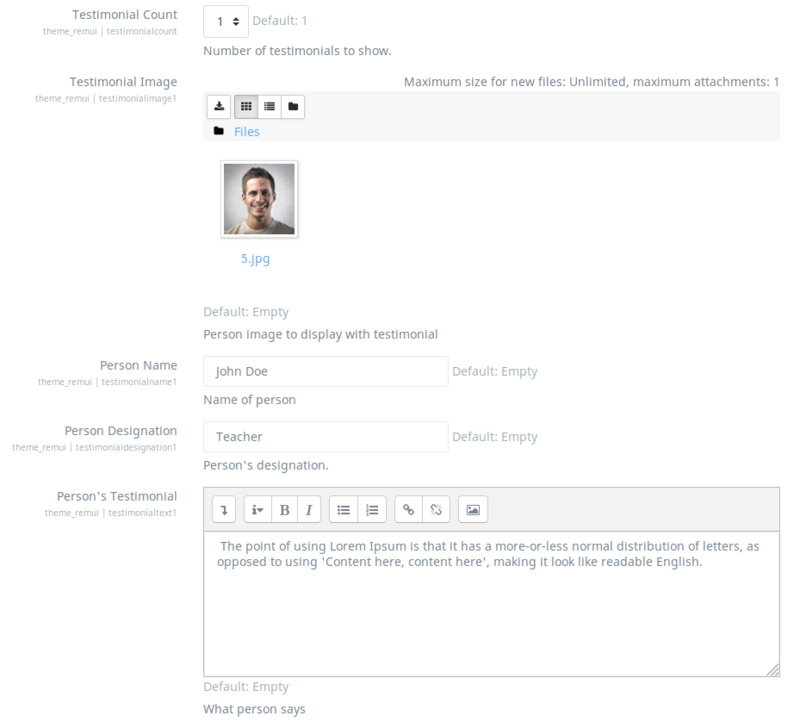 Feature – Ability to add an image as background in marketing spots(frontpage). Feature – News & updates section having RemUI update notifier and RemUI feedback form integrated. Tweak – Activity navigation & flat navigation sidebar minor improvements. Tweak – Forum activity layout improvements. Tweak – Course title text wrap on the archive page. Tweak – Revert sidebar open/close icons to the old version of Edwiser RemUI. Tweak – Overall CSS size reduced by around 200 KB. Fix – Table styling in various pages. Fix – Edit profile tab issues in profile page. Fix – Frontpage slider read more button not clickable. Fix – Atto editor issues while selecting text color, styles. Fix – Site navbar icons and logo placement. 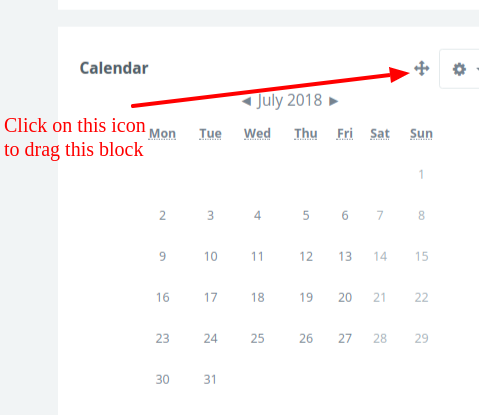 Fix – Dropdowns width while editing on in block sidebar. Tweak – Optimized custom dashboard blocks and available course block on the front page. Feature – Sidebar open/close state save based on user preferences. Fix – Fixed moodle forms on multiple pages. Fix – Fixed Moodle modals. Fix – Minor issues on course page while user editing is on. Fix – Class not found issues on profile and frontpage. Fix – JS & CSS fixes and optimization in whole codebase. Fix – License auto deactivate issue. Fix – IE issues fixed. Fix – Minor JS issues fixed. Tweak – Initial RTL support added. Tweak – Internet Explorer 11 support added. Tweak – Removed unused CSS and JS code. Tweak – My courses page link in the flat navigation sidebar. Feature – Course activity navigation sidebar with progress tracking. Feature – Course background image in course overview block and improved look & feel. Fix – Drag & drop question text in quizzes. Fix – Availability dialogs in certain settings pages. Tweak – Full support for child themes including theme files. Tweak – Restructured footer from 3 column to 4 columns. Tweak – Support for grid course format plugin. Feature – Sidebar state save based on user preferences. Feature – Added French translation. Feature – Course page ‘expand all/collapse all’ buttons state save based on user preferences. Fix – Fixed Moodle modals z-index issues. Fix – Login, logout and registration page text styling fix. Fix – Language string in profile and other pages. Tweak – User preference page CSS tweaks. Tweak – Message response text CSS tweaks on the message page. 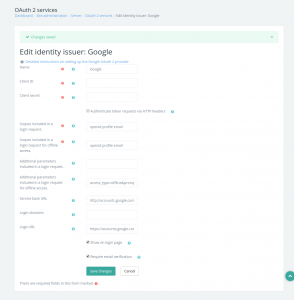 Tweak – Site administration section CSS tweaks. Feature – Flat navigation inspired by Boost theme, New Sidebar mini style with icon support. Feature – Kept old sidebar (< Moodle 3.2) as an option. 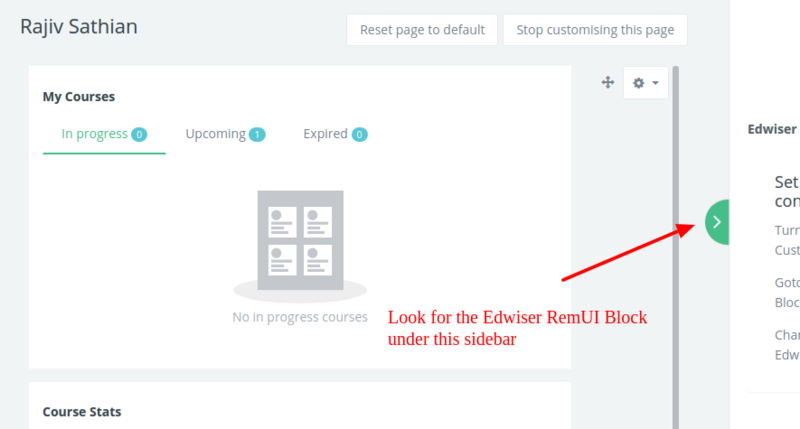 Update – Edwiser RemUI now compatible with Moodle 3.2. Tweak – Added Action menu of course, course categories, profile, assignment pages. Tweak – Optimized theme JS & CSS. Feature – Added Capability for admin to view the users enrolled Courses, Grades, and Notes. Tweak – Login popup in header bar (Configurable). Tweak – Course progress bar is visible in the Course Overview block on Dashboard. Tweak – Display selected category description on ‘Course archive page’. Tweak – Reduction in theme file size which will improve the load times. Tweak – Logo image will auto adjust irrespective of image dimensions. Fix – Minor CSS & JS fixes. Fix – Added default placeholder image in case no image is set for homepage slider. Fix – Expand/Collapse section in course page. Fix – Distorted loading animation in dark sidebar blocks. Feature – Dashboard sections can be set as open or closed per-user basis. Feature – Category based course sorting. Feature – Support for custom site color added color picker can be used to change the color of the site. Feature – Revamped homepage layout. Feature – Revamped login page layout (which blends properly with the overall theme). Feature – Support for plugins like Marking Manager, Grade Me & Course Contacts. Feature – Compatibility with custom course format plugins, for example Flexible Sections. Feature – Checkbox to disable Edwiser RemUI dashboard widgets in the DashBoard settings.